Mayor’s Cup soccer match action. 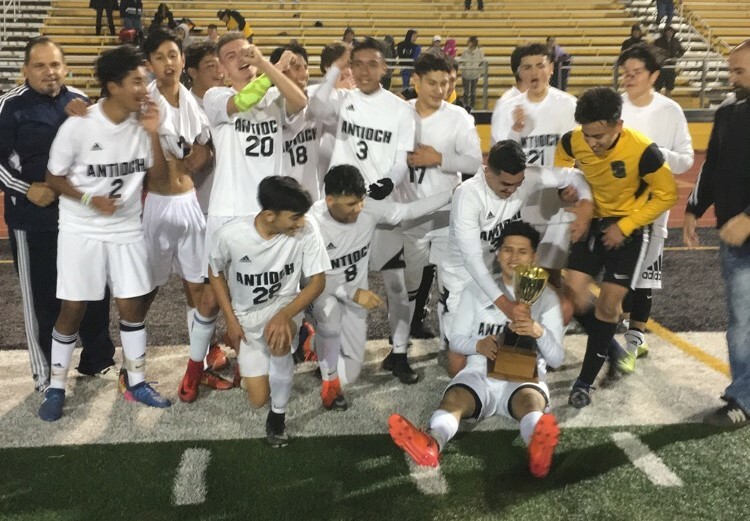 Antioch did not win a single game in Bay Valley Athletic League play, that was until the last two minutes of its Mayor’s Cup soccer match against Deer Valley. The Panthers was awarded a penalty kick, and Liam Gammond stepped up to take it. He blasted a right foot shot in the bottom left corner to give the Panther’s the 3-2 lead. Moments later, the referee blew the final whistle indicating that Antioch had won the game. 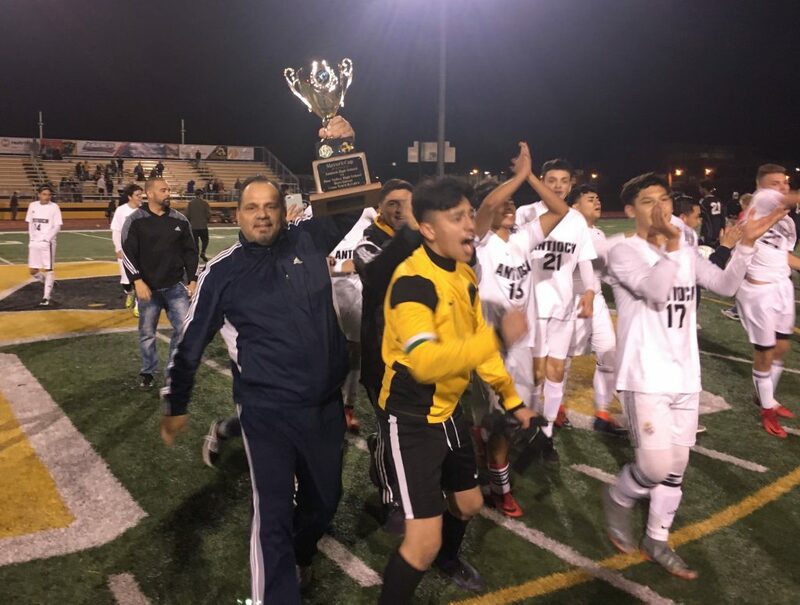 After three long years, the Mayor’s Cup was back at Antioch High. The entire team ran to claim the cup, held up in the air as Queen’s famous song “We are the Champions” blasted from the stadium’s loud speakers. “This is definitely the proudest moment in my soccer career,” Gammond said. However, at halftime Antioch was trailing Deer Valley 2-0. Isaiah Moreira scored both goals for the Wolverines. His first one came on a three-man play, as Rudy Saucedo crossed the ball to Edgard Morazan, who laid it off to Moreira, where he easily finished the ball. The Panthers’ soccer team celebrates winning the Mayor’s Cup Trophy for their victory over the Deer Valley Wolverines. Moreira’s second goal came on a quick turn-around-shot that was out of the reach of Antioch goalkeeper Melvin Morales. Staying strong emotionally and reading past Deer Valley’s defense was a key to success according to Antioch. Antioch’s three unanswered points began with a goal by Gammond. From 35 yards out, he kicked the ball starting to the top right corner. The second goal was scored by sophomore Joel Sanchez, who simply beat Deer Valley goalkeeper Edwin Serrano past the ball. If the game were to remain as a tie, Deer Valley would have kept the cup. Fortunately for Antioch, Gammond had a two-goal night. Coach Diaz provided the list of all the players who were part of the winning team: Soph. Joel Sanchez – Dozier Libbey, Sr. Marco Hernandez, Sr. Octavio Gonzales, Sr. Josue Lopez, Soph. Melvin Morales, Fr. Brian Sosa, Fr. Luis Ramos – Dozier Libbey, Soph. Noe Moreno, Jr. Daniel Doan, Jr. Liam Gammond, Soph. Ian Scheringer, Jr. Alberto Castillon, Jr. Israel Cardoza, Soph. Regulo Arjona, Soph. Jorge Gutierez, Soph. Josmar Belstre, Soph. Daniel Iraheta, and Jr. Cesar Rubio – Dozier Libbey, and Assistant Coach Dan Doan. This entry was posted on Saturday, February 3rd, 2018 at 3:41 pm and is filed under News, Sports, High School. You can follow any responses to this entry through the RSS 2.0 feed. You can leave a response, or trackback from your own site. We’ll add that to the article. Congrats on the win!